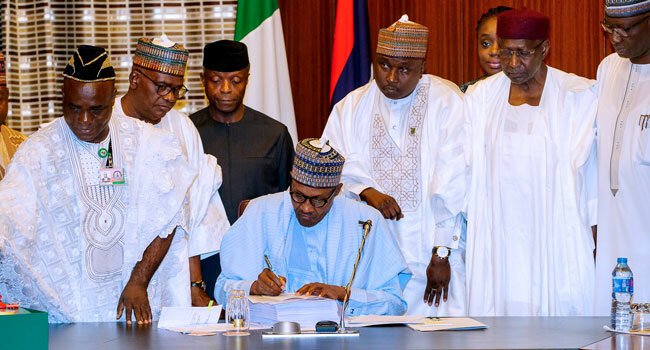 President Muhammadu Buhari signing the 2018 budget at the Presidential Villa on Wednesday, June 20, 2018. President Buhari, however, criticised the National Assembly for reducing allocations for some projects and including thousands of projects into the budget without consultation with the Executive. He said, “The National Assembly made cuts amounting to 347 billion Naira in the allocations to 4,700 projects submitted to them for consideration and introduced 6,403 projects of their own amounting to 578 billion Naira. According to the President, not only did it take the lawmakers longer than expected to pass the budget, the final outcome was not what was expected. “When I submitted the 2018 Budget proposals to the National Assembly on 7th November 2017, I had hoped that the usual legislative review process would be quick, so as to move Nigeria towards a predictable January-December financial year,” he said. Regardless of the setback, the President is determined to continue working with the National Assembly to improve the budgeting process and restoring Nigeria to the January-December fiscal cycle. This, he explained, is because although the Federal Government’s budget represents less than 10 per cent of aggregate yearly expenditures in the economy, it has a very significant accelerator effect on the financial plans of other tiers of government, and even more importantly, the private sector, which mostly operates on a January-December financial year. The President signed the budget in company of the Vice President, Yemi Osinbajo, as well as the Secretary to the Government of the Federation, Boss Mustapha, and the Chief of Staff to the President, Abba Kyari. Some of the ministers, who witnessed the signing are Senator Udo Udoma (Budget and National Planning), Lai Mohammed (Information and Culture), and Kemi Adeosun (Finance).